At times the theatre scene feels a bit myopic, companies spinning around the same old dramatic and musical standards ad infinitum. Quality aside, it gets a little tiring when you learn that perennials like Miss Saigon or Uncle Vanya have returned for umpteenth time to London. All Star Productions recognise this and draw upon the enormous library of the ignored, the unstaged and the forgotten. These are the orphans of the modern stage, productions floating in eerie dramatic limbo. The Apple Tree, tonight's production, is a prime example. It has a good of pedigree, written by the hits factory of Jerry Bock and Sheldon Harnick, famous for Fiddler on the Roof. Originally performed on Broadway in 1966 it ran for 463 performances, so there must be something worthwhile here. And so, blowing decades of dust from the yellowed songbook, All Star Productions breath life into the old bones. This is production is a triptych: the first act a couples comedy based on Mark Twain's The Diary of Adam and Eve, the second Frank R. Stockton's The Lady or the Tiger? (a historical love story) and the third a Hollywood reimagining of Cinderella adapted from Jules Feiffer's Passionella. These very different settings require quick changes and All Star's cast swap roles like they're shuffling a deck of cards. Nicely, nearly all the cast get a moment in the spotlight, so the leading lady in one segment might be a backing dancer in another. 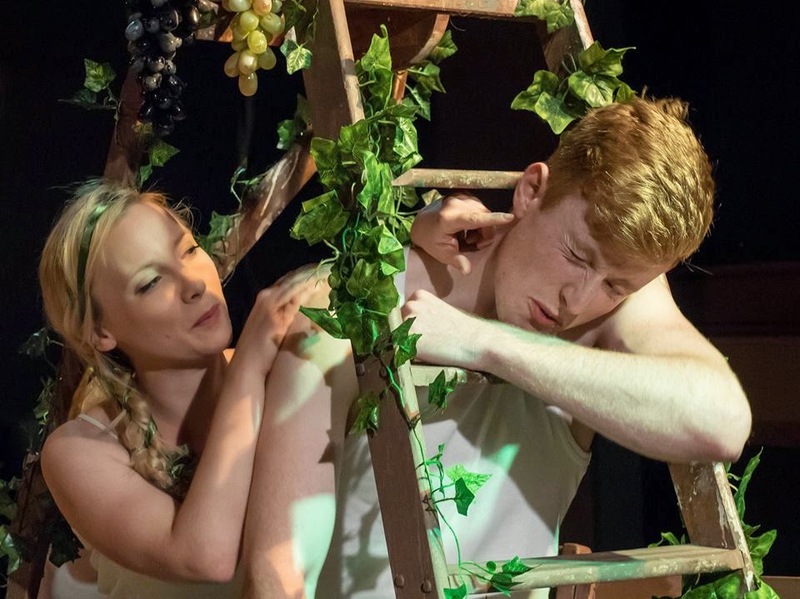 Catriona Mackenzie and Rafe Watts as Adam and Eve. But is it any good? Well that's a bit trickier to pin down. Awkwardly for critics, there's nothing objectively wrong with anything this cast and crew do. Crammed into the slightly pokey space above a pub is a real surfeit of talent. 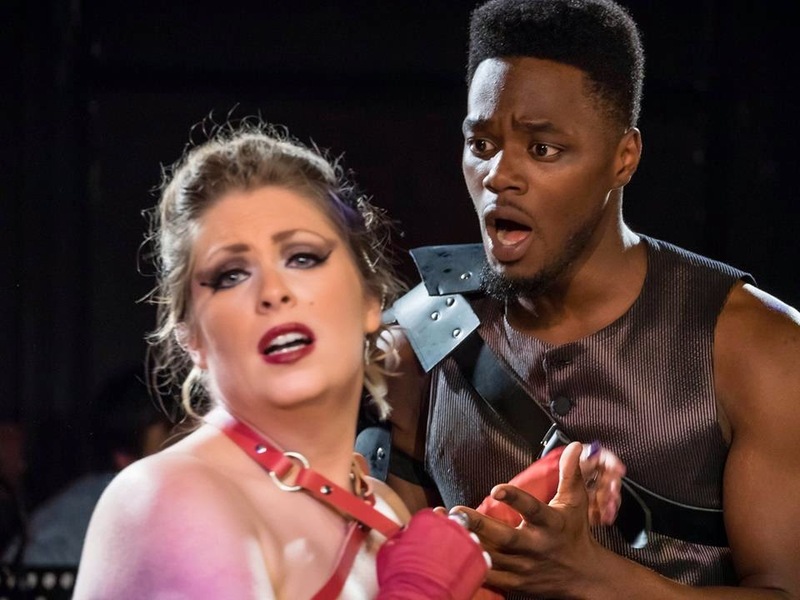 This fresh-faced cast throw themselves onto the stage with aplomb, relishing the chance to really stretch their dramatic muscles in these broadly comic roles. The small orchestra, led by upbeat looking Musical Director Aaron Clingham, appear to be having a similarly good time, smiling happily at the rear of the stage and consistently note perfect. With that all locked down, what could possibly be go wrong? Well some of forgotten, rarely staged productions are rarely staged for a reason. The opening Adam and Eve segment is a downright gruesome slog through middle-class 1960s humour, reimagining Genesis through the lens of a couples sitcom. Trapped in the middle of this, Rafe Watts and Catriona Mackenzie frantically man a dramatic defibrillator, putting in downright Herculean efforts to wring laughs from gags so creaky they'd make a dinosaur groan. But it's to no avail - this material is practically prehistoric and doesn't hold up at all in 2014. This segment runs to about an hour, taking us from creation to Adam's old age. Biblical scholars tell us he lived to the ripe old age of 930, and believe me I felt every one of those years. It was with a curl of worry winding around my belly that I realised I might have at least another two hours to go of stuff like this. Thankfully the following two segments were a) better and b) shorter (though the latter might have influenced the former). After the narcosis of Adam and Eve, The Lady or the Tiger? gives the night a big shot in the arm. Set in a vicious barbarian kingdom, this is based around the conceit that rather than engage in trials they simply present accused criminals with two doors. Behind one is a ferocious starving tiger, behind the other a comely lass who must be married forthwith. This isn't the most original setting, but the setting allows for tight martial dancing, a lot of yelling and some loud banging, all of which keep my attention. Also helping is a marvellous physical turn by Rosie Glossop as Princess Barbara, taking every conceivable opportunity to strike hilarious hieroglyph poses. After a short turnaround we're onto the final segment. This updated Cinderella story is still plagued by dated jokes, though the brevity and dynamic choreography elevates the material into the realms of the genuinely entertaining. Michaela Cartwright, playing the lead in brushstrokes so broad she may as be using a roller, has fun both as a cheeky cheery cockney chimney sweep and the rather drag-queenish glam starlet Passionella. This tale rumbles along in a breezily pleasant manner, wrapping up the night in a way that, if not show-stopping, is at least competent. 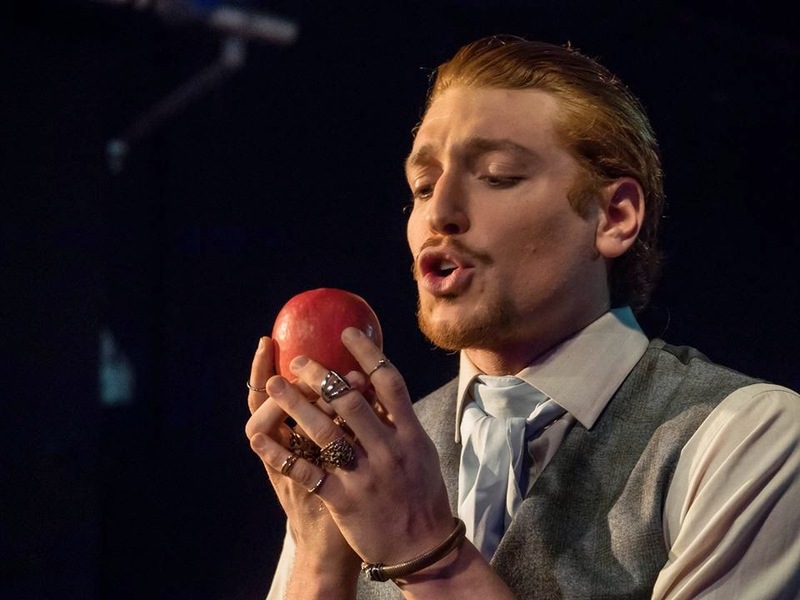 The undoubted highlight of all three tales was Daniel Donskoy. He played the Snake in the first, and the narrator of parts two and three. To put it simply he's straight up marvellous, a magnetic stage presence underscored with a Jaggeresque sexual dynamism and a faintly diabolical demeanour. Only he truly succeeds in reanimating the material, willing it to life by sheer force of his personality. The Apple Tree is a production that's probably best left forgotten. The tone is decrepit, the creaky old jokes inducing mild, polite titters rather than big belly laughs and the music okay but unmemorable. It's a bit of a shame, because the cast and crew have pulled out every stop they can to make this work, but you can't make a silk purse from a sow's ear (particularly when the sow has been rotting for 50 years). It's not bad per se, but it's definitely not my kind of thing. A passing thought I had was that my Gran would have enjoyed it - and that's about as good a recommendation as I can give. 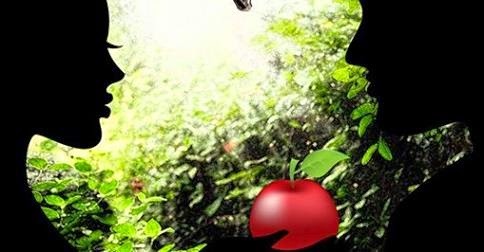 The Apple Tree is at Ye Olde Rose and Crown Theatre, Walthomstow until 30 August. Tickets here.